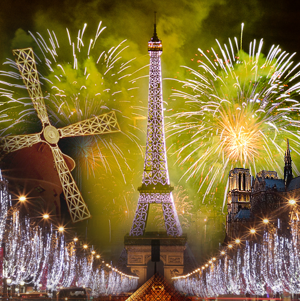 Paris is one of the most colorful and exciting places to celebrate New Year's Eve, whether your preferred style is clubbing the night away, or a simple glass of champagne shared with a small group of friends or loved ones. We will be there at the Champs-Elysees the place be at the center of the party with a good view of the Eiffel Tower sparkling at the stroke of midnight. Evening departure from selected pickup points. Morning arrival to Paris and opportunity for breakfast. We then tour the City's most decorated highlights from Notre Dame Cathedral to The Concorde Square and from The Opera House to The Champs Elysees and much more. The will some free time at the Eiffel Tower before checking into our 4* Hotel. 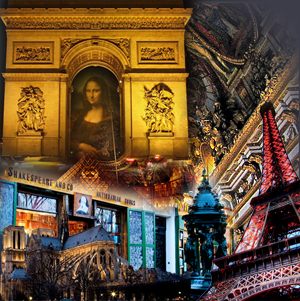 Enjoy the evening exploring the joyous atmosphere Paris knows all too well to offers during the holidays. Your tour guide will assist with suggestions and any arrangements such as attending the Moulin Rouge Show! Spend the day investigating the unique and bustling flair of the Capital or else we would recommend joining us on an excursion to one France's most visited attraction, the imposing Palace Of Versailles. This iconic and impressive represent one of the Western Civilization key developments and the undeniable Power of France during its heydays. Tour will end at the Louvre home of one of the richest and unique collections of Arts anywhere in the world. Your tour guide will be happy to assist with an evening outing perhaps a French Show such the Moulin Rouge. Hotel check out and free time. Following some free time for lunch we bid farewell to Paris for homeward journey returning to points of origin arriving late evening hours. Montmartre is well known as the last village in Paris. The place de Tertre, a few streets away from the Sacré-Coeur Catholic basilica, is in the heart of Montmartre. The Painters Square is a reminder of the time when Montmartre was the Mecca of modern art. The Champs-Elysees is the place to head if you want to be at the center of the party. Starting at around 9 p.m. on New Year's Eve, people start to flock to the famous street, often bringing along bottles and plastic flutes. From many places on the Champs-Elysees, you can get a good view of the Eiffel Tower, which explodes into a sparkling dance of light at the stroke of midnight. The Sorbonne University is the historic soul of the Latin Quarter, where higher learning has flourished for centuries. Founded in 1257 for a small group of theology students, the Sorbonne is one of Europe's oldest universities. 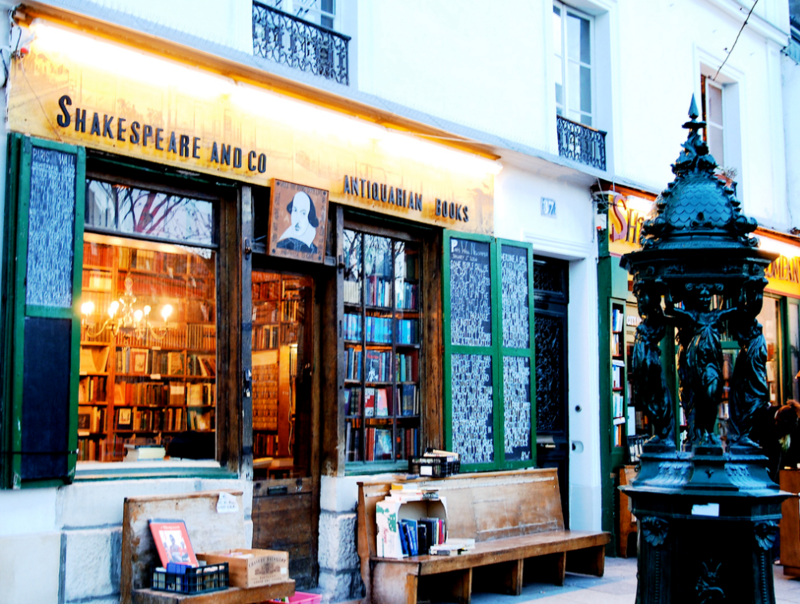 It has hosted countless great thinkers, including philosophers René Descartes, Jean-Paul Sartre, and Simone de Beauvoir. Enjoy a drink on the café terrace in front of the college before exploring the winding little streets of the Latin Quarter behind it. No first trip to Paris is complete without a visit to this marvel of gothic architecture. One of the most singular and beautiful cathedrals of Europe, Notre Dame Cathedral's dramatic towers, spire, stained glass and statuary are guaranteed to take your breath away. There is probably nothing more sincere than the feelings of those hundreds of thousands of people who gather at the Concorde Sq. to celebrate the new beginning. Join us as we ring in the new year with those who are determined to make peace and prosperity prevail against all odds. Even if you do not want to visit this world famous structure, you will see its top from all over Paris. The tower rises 300 meters tall (984 ft); when it was completed at the end of the 19th century it was twice as high as the Washington Monument, at the time the tallest structure in the world. The 164-foot Arc de Triomphe commissioned by Emperor Napoléon I does exactly what it was made to do: evoke sheer military power and triumph. It was built in an age when leaders erected monuments in their own honor, and scaled to their egos. The arch's beautiful sculptures and reliefs commemorate Napoléon's generals and soldiers. Visit the Arc de Triomphe to begin or culminate a walk down the equally grandiose Avenue des Champs-Elysées. You can't help but feel grand yourself. Montmartre is well known as the last village in Paris. Cobbled streets of one of the most historic and interesting neighborhoods in Paris, streets lead to Basilica of Sacre-Coeur on the top of the hill. Place du Tertre - the Painters Square a few street a way is a reminder of the time when Montmartre was the Mecca of modern art. At the beginning of the 20th century, many penniless painters including Picasso and Utrillo were living there. Tour guide lead the group through points of historical, cultural or regional interest and are responsible for ensuring the travel arrangements. For questions about Visa requirements & entry to certain countries that are not covered in the tour information on our web site please contact your orderly room and/ or Passport office for clarification. Make sure you have a signed, valid passport, and a visa, if required, and fill in the emergency information page of your passport.